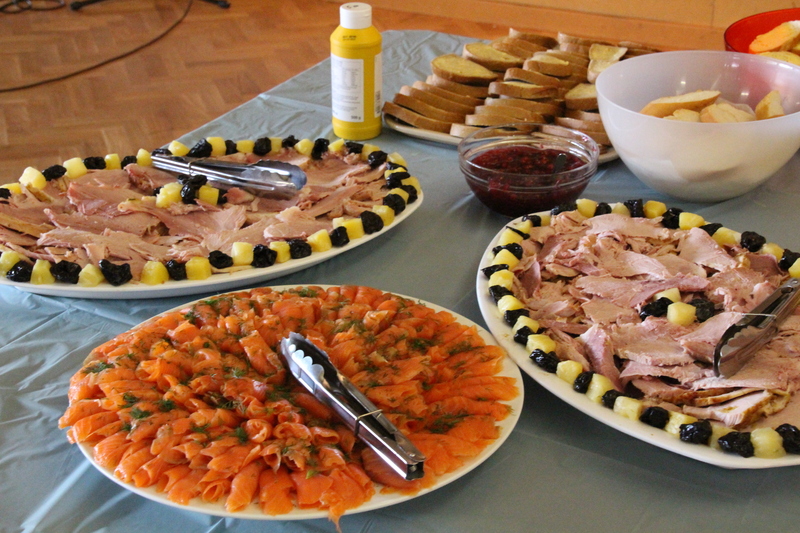 On Monday the 7th of December 2015, we celebrated what would have been Sibelius’s 150th birthday the next day, and finished it all off with a traditional Christmas lunch smorgasbord. Over 80 people attended the event, which included some history about the life of Jean Sibelius (thank you to Anneli Rickards for the interesting facts and presentation), arguably Finland’s most loved composer from the turn of last century, when his famous opus 26 – Finlandia – was written. We viewed a short video on his life and music, and sang together his Finlandia Hymn – accompanied on the piano by one of our young volunteers, James, who played rather nicely considering he had not ever seen this music up until 3 weeks before the event! A table of plenty awaited the guests while raffle prizes were won, and even Santa and his little helper arrived to hand out treats to all. This was followed by singing of Christmas carols, accompanied by our long time Yuletide helper, Ms Minna Ikonen on piano (and finished off with her special rendition of the 12 days of Christmas – Finnish style!). Our Estonian friends were invited as our special guests to join us for this event, and together we sang and laughed and ate fabulous food til our tummies groaned, with just enough room for a good cup of Finnish coffee and a little something sweet to go with it. With smiles all around, we farewelled everyone with a hug and lots of good cheer, and look forward to a peaceful and safe lead up to Christmas and the holiday season that follows. Thank you to the staff and volunteers and friends who helped out in any way to make our special event a wonderful success, and to the Multicultural Council of Victoria who helped to support the event.